Chances are, you probably have a teddy bear. They’ve remained one of the most popular toys in America for over 100 years. But who invented the first one? In 1902, President Theodore (“Teddy”) Roosevelt went on a hunting trip. At the end of the trip, he’d found nothing. His hosts didn’t want him to leave disappointed and flushed out a baby grizzly bear. The president refused to shoot the little bear. Clifford K. Berryman drew a cartoon of the incident which was published in The Washington Post and other newspapers around the country. The story was instantly popular. A Brooklyn merchant, Morris Mitchtum, saw an opportunity. He asked his wife to sew a plush bear with movable limbs. He placed the bear in the window of his store, along with a copy of the cartoon. He dubbed the bear, “Teddy’s Bear.” Within a year, he was manufacturing and selling hundreds of the bears. 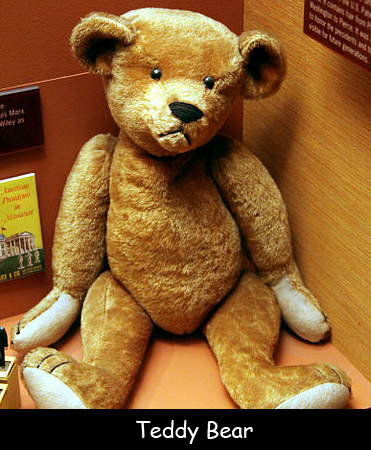 German toymaker, Richard Steiff, designed a toy bear around the same time after seeing a bear at the Stuttgart Zoo. The bears were displayed at the 1903 Liepzig Toy Fair. Here, an American merchant ordered 3,000 bears, launching Steiff’s success. By 1907, almost 1 million bears were made in Germany every year. Question: Who was the first inventor, Steiff or Mitchtum? Answer: It’s hard to say. Oddly enough, they both invented the bears around the same time without having prior knowledge of the other one’s activities. And they were inspired by different events. Learn more about these cuddly, lovable toys.